Oakleigh is a residential suburb with considerable secondary industry 15 km south-east of Melbourne, immediately beyond Caulfield and Malvern. Until 1853 the area was known as Scotchmans Creek, when the name Oakleigh was given to it. The name may derive from she-oaks growing near Scotchmans Creek, from Oakleigh Park, near Malvern Hills, Hertfordshire, England, or from an early settler, Mrs Oakley. Scotchmans Creek's headwaters are in present day Mount Waverley and flow westerly. In 1840 John McMillan leased the Scotchmans Creek grazing run, stretching over land from Mount Waverley to Oakleigh, much of which came under Oakleigh Shire (1871). Then came a complicated series of boundary changes. The connection between Oakleigh and Mulgrave was predominantly along Ferntree Gully Road, which began near the original Oakleigh township on Dandenong Road, known locally as the Broadway. Oakleigh's influence in the Mulgrave area was persistent, and the Mulgrave Shire's Council meetings were held in Oakleigh township for the shire's first 23 years. The Broadway is about 500 metres south of Scotchmans Creek, and it coincides with the place where an animal pound was established in 1842 (the South Yarra Pound). Nearby the South Yarra Inn was built a few years later. In 1853 the Oakleigh township was surveyed and allotments sold. A Church of England was opened in 1854. Oakleigh was on two main roads, Ferntree Gully Road to the Dandenong Ranges and Dandenong Road to Gippsland. In 1865 Oakleigh was described as partially cleared land of variable quality, some being suitable for growing root vegetables. Timber cutting was the main industry. Short-lived primary schools had functioned in the early 1850s, and the forerunner of the present day school was begun on a Wesleyan church site in 1855. In 1877 the railway to Gippsland was begun, its Melbourne commencement point being Oakleigh. Two years later its extension from Oakleigh to South Yarra was completed. Oakleigh's strategic importance in railway movement was strengthened when a metropolitan ring railway, known as the Outer Circle, was opened in 1890, commencing a short distance west of Oakleigh at Hughesdale. The Gippsland railway line, about 1 km south of the Broadway, occasioned the shift of Oakleigh's commercial centre. 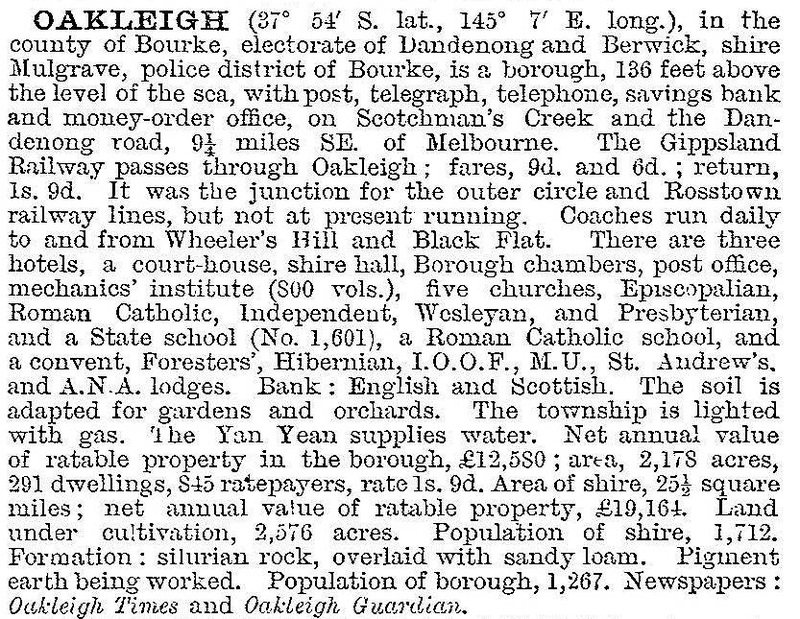 In 1890 the Victorian municipal directory described Oakleigh as having three hotels, four churches, a bank, a court house and a school. There was market gardening, and nearby wooded country was frequented by hunters and shooters. The Oakleigh municipality’s northern area was the Broadway, with brick and tile works extracting the local clay. In the middle was the railway township. In the south there was sand mining, a component of the mortar that bound together the bricks for urban housing. Some sand pits later became rubbish tips. Oakleigh's urban potential was increased by the addition of part of Caulfield, comprising present day Hughesdale, in 1913. 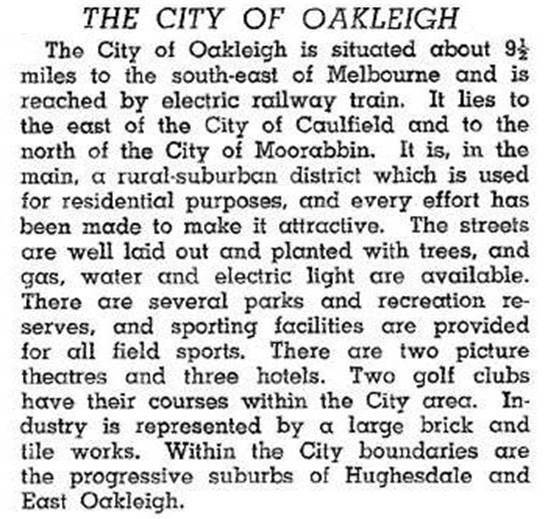 In 1924 Oakleigh was proclaimed a town and on 2 August 1927, a city. By then the Oakleigh area was substantially built up, and housing was extending to Hughesdale and Huntingdale (East Oakleigh) in the vicinity of their railway station. At the close of the war these areas were described as rising suburbs. Oakleigh municipality expanded eastwards into Mulgrave shire in 1948 and in 1959, another extension reached as far as Blackburn Road including the site of the future Monash University and all of Clayton South. The enlarged Oakleigh city was unchanged when it was amalgamated with Waverley city (formerly Mulgrave shire) on 15 December 1994, to form Monash city. For the first ten postwar years Oakleigh's Warrigal Road was a boundary between a built up area to the west and a developing area with unmade roads to the east. This was particularly so as one moved southwards along Warrigal Road away from the railway line. The land in Oakleigh South was sandy and fairly flat, suitable for golf courses. The area has the Metropolitan, Commonwealth and Huntingdale Golf Clubs. In the 1950s to 1970s Oakleigh was at the forefront of urban change. In 1960 the Chadstone drive in shopping centre was opened on the border of Oakleigh, about 1.5 km from the Oakleigh shopping centre. Although trading in the three or four active streets in the Oakleigh shopping centre was maintained with one way traffic and pedestrianisation, the contrast with climate controlled Chadstone was apparent. In the early 1980s the railway goods yards were redeveloped for the Oakleigh central shops. Australia's first motel was opened on Dandenong Road, Oakleigh East (1956) and the first 7-Eleven convenience store was opened on Warrigal Road (1977). East of the shopping centre along the railway line there are substantial industrial properties, several lying idle from the reduction of Australian manufacturing. In the housing area postwar settlers were replaced, some newcomers being Greek, and later Turkish. However, despite the inflow of those residents the population of Oakleigh municipality during the mid-1990s experienced one of Victoria's fastest rates of decline. The median house price in Oakleigh during 1987 to 1996 was about the same as the median for metropolitan Melbourne. The median weekly income, however, was substantially less than neighbouring Caulfield and Waverley. Forty-six percent of children in Oakleigh were assessed in 1997 as belonging to families on welfare benefits or classed as working poor, substantially more than in Caulfield or Waverley. Property prices nevertheless had an upturn in 1998, the median house price reaching 22% above the metropolitan median. The prominent red-brick Oakleigh Technical school (1946) and the high school (1955 – actually in Clayton) were closed and sold for housing in the mid-1990s. Municipal or ‘greater’ Oakleigh ceased in 1994 and the present suburb’s area is about half that of the borough of 1891. Its boundaries are Scotchmans Creek, Huntingdale and Warrigal Roads, except for a protruding wedge of East Oakleigh at Ferntree Gully Road. The original civic centre has been retained: primary school, recreation reserve, mechanics’ institute, pioneer cemetery, Uniting church and former Presbyterian (now Coptic Orthodox) church. Oakleigh’s Catholics moved from their Broadway church to a new building in Warrigal Road in 1924. The Anglican church near the old Broadway (actually in Malvern East) has its 1854 building, now heritage listed. The shopping centre is around the railway station and any old shops on the Broadway have been replaced by car dealers and display rooms. The former council office (1921) and post office include a heritage centre and the war memorial (originally in the middle of Dandenong Road) is nearby. North of Dandenong Road there are several parks and reserves with ovals, the Oakleigh Recreation Centre and a swimming pool (1958). Scotchmans Creek has a linear park and walking trail. The other side of the creek is Chadstone.